Lion is the story 5 year old Saroo and his older brother Guddu who are living in the small village of Khandwa in India. With work and money scarce the whole family works just for milk to drink and some food in their bell. The boys steal coal from a train for some scraps and Guddu goes into town to work shifting hay bales for some money. Saroo tags along with his brother and falls asleep on the train. After stopping in the dead of night, a sleeping Saroo sleep at the station while Guddu gets some food, then a series of mistakes separates the boys by 1,400 miles. As Saroo wakes he shouts for his brother, but with no one around he searches a decommissioned passenger train which speeds its way to Calcutta. As he arrives in Calcutta, the sheer volume of people ignoring a 5 year old lost boy makes you want to reach through the screen and save him. After escaping child thiefs and sleeping rough for 2 months. Saroo is placed into adoptive care which by indian standards isn’t a blessing, but Mrs Sood shows her compassion for the little boy and helps him get adopted to a family in New Zealand. The 2nd half of the film jumps 20 years later, with Saroo attending a hotel management course and meeting Lucy played by Rooney Mara. As time goes on the pain and desperation portrayed by Saroo not knowing if his mother or brother are ok, if they know he is alive and how much the mean to him. The inner conflict of looking for his parents and telling his adopted mother, portrayed by Nicole Kidman in an oscar worthy performance, makes his pain more unbearable and drives him to leave school and find his home. The strength of this film is the performances are from De v Patel, Nicole Kidman and Sunny Pawar who plays the young Saroo, he mesmerises as the young Saroo lost and alone, but full of smiles and hope. Gareth Davis uses amazing cinematography to show a small boy lost in Calcutta, a city with over 4.7 million people. The sight of the young Saroo alone and afraid breaks your heart, his performance steals the first half of the film. 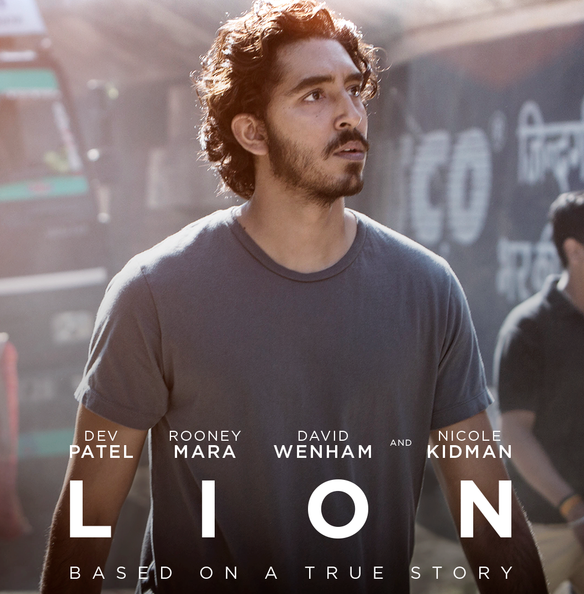 Dev Patel takes over the second half and totally brings full circle his feelings of desperation and isolation. As the urge to finds his parents takes hold he begins to fall apart, the conflict of finding his mother and from not telling is adopted mother causes such heart ache for him. The amazing part of the story is that its all true, no hollywood glamour, no screenwriting, 100% true and its such a true adaptation of the book. I don’t understand how Dev Patel and Nicole Kidman are up for actor in a supporting roles at this years oscars, they were the leading roles, but I am glad Lion is up for best picture.